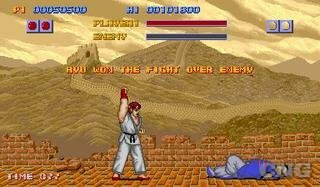 Interview with Takashi Nishiyama, Street Fighter and Fatal Fury creator. (12-14-2011) Originally appeared in 1UP Presents #3: The Sketch Issue. The game industry has a long and sad list of thriving developers who rarely do interviews. Jason Jones at Bungie, Sam Houser at Rockstar, Doug Church now at Valve. 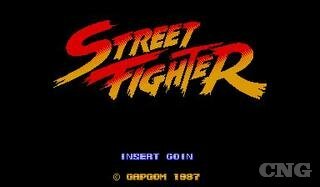 One name you might not know, which should be on that list, is Takashi Nishiyama, who designed the original Street Fighter at Capcom before leaving to run SNK's development division, putting games like Fatal Fury, King of Fighters, and Samurai Shodown under his belt. In 2000, he founded the company that would become Dimps, itself a below-the-radar team that's worked on the Sonic the Hedgehog, Dragon Ball Z, and Street Fighter series, amongst others. met with us at a satellite business office in Tokyo (seen here). Nishiyama has intentionally shied away from media over the years. In fact, he hasn't done a single interview in the 12 years since founding Dimps. Until now! He recently agreed to meet at Dimps' satellite Tokyo office because he says he wants the company to change and move into developing original properties, and feels it's important to announce that publicly to make it happen. So we'll get to that. But to kick things off, I wanted to talk about his history. ● Let's start easy. How did you get into the game industry? Wow, that was almost 30 years ago. 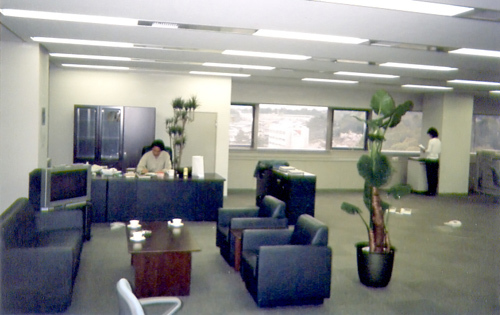 I started at Irem, and current Capcom chairman Mr. Tsujimoto was in charge at the time. This was around the end of the Space Invaders boom, so a lot of new companies had formed, and Irem was looking for the next big thing. They were putting a lot of effort into new games, and I just happened to be in the product development division at that time. ● Is that what you planned to do growing up? Not at all. I originally actually wanted to become a newspaper journalist. I just happened to get a part time job at Irem, and it was a time when they were putting a lot of effort into development, so I wrote up a concept document and showed it to my boss. He read it, liked it, and suggested I pursue this as a career. ● Nice. Do you remember what was on that document? 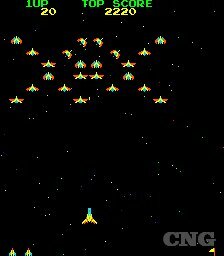 The first game design I worked on was UniWar S. I doubt you're familiar with it, but it was a ROM-based game that used Namco's Galaxian hardware. 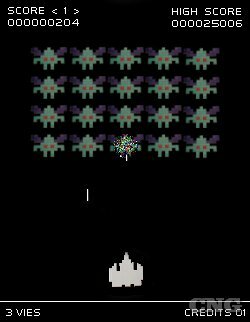 The second game was Moon Patrol, and I believe that was distributed by Williams in the U.S. You might remember that one -- the player drives a buggy across the moon's surface while avoiding craters and rocks and being attacked by UFOs. ● Yeah, it's pretty well-known in the U.S. 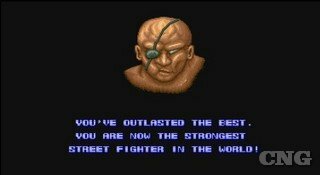 But you're probably best known -- at least based on your time at Capcom -- for the original Street Fighter. How did that come about? 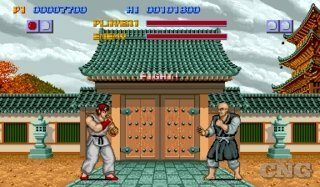 When I was still at Irem, I made a game called Spartan X; I think it was called Kung-Fu Master overseas. Basically, I was the producer on that game and Capcom headhunted me. Then after I moved over, I was able to improve on what I did there, and that became Street Fighter. to spawn one of the industry's most popular genres. ● Was that basically your design concept, or was there more to it? Part of it came from practicing martial arts at the time. But I was also thinking games up to that point were rather simple. 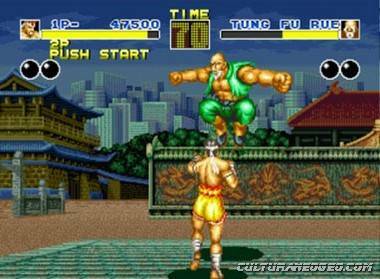 Prior to Street Fighter, there were shooters and driving games where enemies or objects would appear, and the player would shoot them down or avoid running into them. And I wanted to add depth with a story. It just happened to be a fighting game, but I wanted there to be a story so it would feel like a movie. We even conceptualized details for the characters that we didn't put in the game itself -- what the characters might like to eat, do they have sisters, other family members, etc. 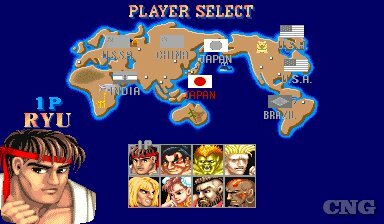 Street Fighter was different from prior games in the amount of depth we gave the characters. ● OK so apart from the story, what were your main contributions on the team? My biggest contribution was pushing for the eight-directional joystick and six buttons. But initially I created a cabinet that used pressure-sensor mechanics. At the time, Capcom didn't have any experience making large arcade machines, only tabletop games, and we had a mission to make a large machine. So we worked with Atari to make a punching bag where the game used pressure-sensor mechanics to measure the player's punch strength. Unfortunately, that didn't sell too well because it was expensive, and it had a low replay value because playing the game was exhausting. 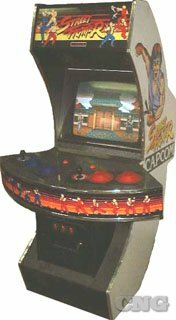 On top of that, Capcom didn't have expertise in selling large machines, so we shifted our direction and went for the joystick and buttons. 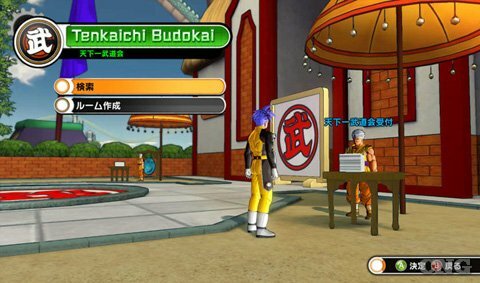 ● What about the fireball and dragon punch? Were those your ideas? Yeah, those were mine. I was inspired by anime and manga from the time, so for example the Hadouken was inspired by a Japanese anime called Space Battleship Yamato. 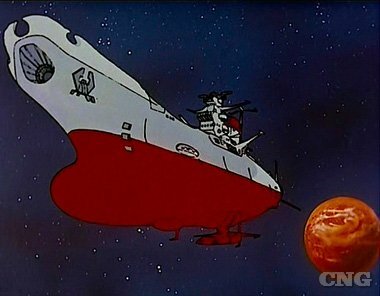 In that, the battleship has a laser missile called Hadouho -- it collects energy and then blasts it into space, destroying the enemy. That that's where I got the idea for the Hadouken. The Shoryuken and Tatsumaki Senpuukyaku were original ideas -- I took martial arts moves and exaggerated them so they looked like special attacks. 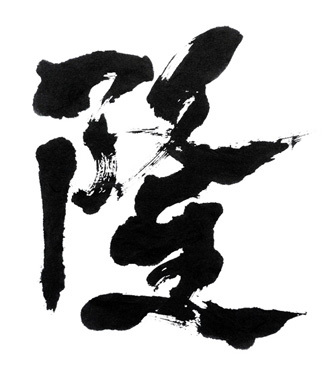 for the first Chinese character used to spell Nishiyama's name "Takashi" can also be pronounced "Ryu." Dimps submitted the above Sumi-e drawing showing off this trivia for this story. ● I ask this question a lot, but were there any big close calls during development -- things in that game that came close to happening, but then changed along the way? The most interesting story that comes to mind is that most games at the time used a joystick and two buttons, so when I proposed the joystick and six buttons, the sales team said that the game wouldn't sell because it was going to be impossible for players to control. But I forced the development team to make it and explained that although there were more buttons, the layout fit people's natural form. I remember struggling to convince people that it would work. ● How did you convince them? 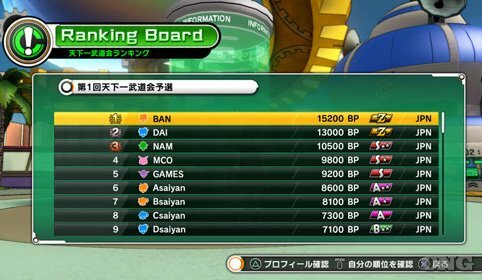 I explained that the top three buttons controlled punches and the bottom three were kicks, so it felt natural for players to perform special moves by combining those -- at least that's what I thought. But since all six were attack buttons, and players would attack no matter what button they pressed, that helped convince them that having more buttons wouldn't make the game overly complicated. ● Were there other big ideas that didn't quite make it into the game? There were a lot of things that didn't make it in. But I was headhunted by SNK after its release, and many members of the development team and I moved over. 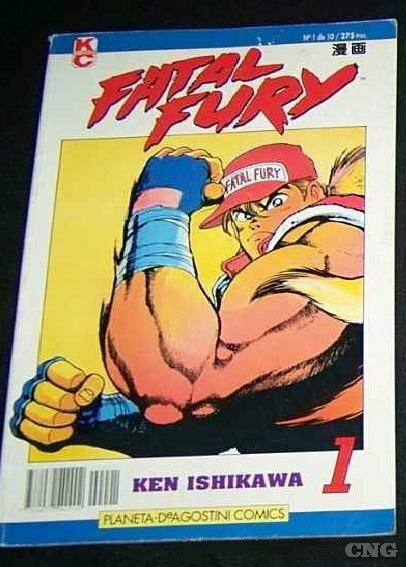 So we went on to make Fatal Fury, and we put in a lot of the things we couldn't in Street Fighter. 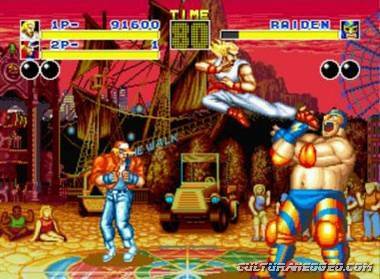 So for me, Fatal Fury is my "Street Fighter II." 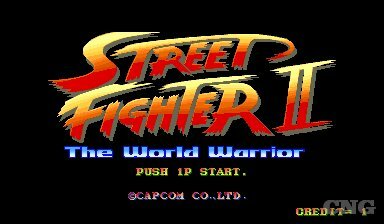 And the actual Street Fighter II was created by someone else at Capcom after I left. So that's where the vision for Street Fighter diverged; the continuation of Street Fighter that I had in mind with Fatal Fury, and the Street Fighter II that Capcom created. the sequel, with a heavier focus on combos. 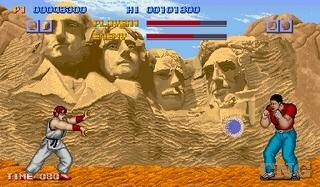 ● Which specific ideas that you wanted to put in Street Fighter did you incorporate into Fatal Fury? The depth of the characters that I mentioned earlier -- that was a big thing. 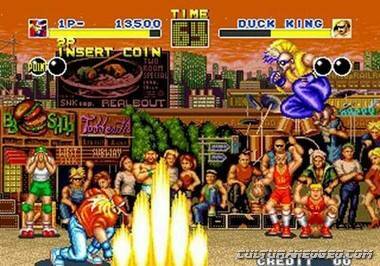 The story and the character backgrounds were more polished in Fatal Fury. We came up with character details that weren't included in the game, and shared that information through the media, in magazines and books, to get the users more emotionally attached. We did a lot more marketing and strategic planning for that game. 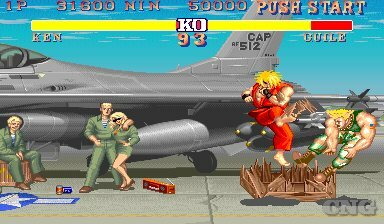 Also, for me, the difference between SNK's Fatal Fury and Capcom's Street Fighter II is that Fatal Fury is more about special attacks. 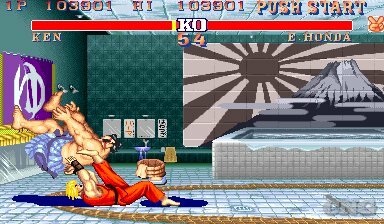 It's crucial when players release their special attacks, whereas in Street Fighter II it's more about combos. That's not something Capcom and I discussed ahead of time, but it happened to turn out that way. ● You mentioned you were headhunted by SNK. Was it a hard decision to leave Capcom? Yes, it was very difficult. I was close to a lot of people there -- Mr. Tsujimoto even hosted my wedding, and we had a personal relationship from back when I was at Irem and he was the president there. He left Irem for Capcom and I eventually followed him. But there were some differences in the direction that Capcom was heading and the direction I wanted to go, so there was a bit of a rift when I left to go to SNK. I'm going on a tangent here, but this is the first time I've talked to the media, including Japanese media, since founding Dimps. Even when I was at Capcom, I never really talked to the media. But Dimps is celebrating its 12th anniversary this year and we're looking to change the direction of the company, so your interview request came at a very good time for us and I'm grateful to be given this opportunity. Since I've never really talked too much to the press, this is the first time I'm sharing these stories with the media. Street Fighter as his favorite of the company's franchises. ● I should thank you! I was very happy you agreed to meet, since we always hear your name but rarely hear from you directly... So what kinds of things were you disagreeing with Mr. Tsujimoto about at that time? 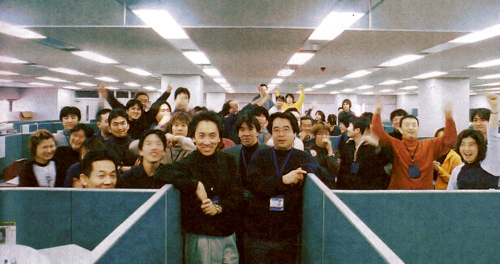 At the time, Capcom had three development teams: Development Team 1, 2, and 3. Again, this is going to be information that is not very well known. 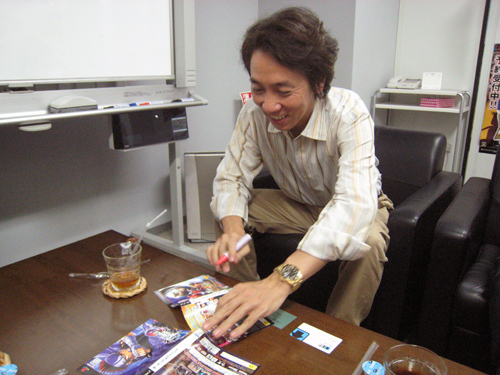 Development Team 1 was led by Mr. Fujiwara, who's known for making Ghosts 'n Goblins. I was the head of Development Team 2, and Mr. Okamoto was the head of Development Team 3 -- he moved on to become Capcom's senior managing director, and eventually left and founded Game Republic. So there were three unique individuals leading the development studios, and my management style differed from the other two in that rather than being the sole creator of a game, I liked to appoint producers underneath and distribute the various ideas I had and have them flesh out the details. And that's what I wanted to do but wasn't able to at Capcom -- I was constantly put in the role of a producer and it was becoming uncomfortable. In addition, I wasn't getting along with my direct supervisor, so that was another factor for why I left. ● Who was your direct supervisor? Hmm... Well, he passed away, so I don't want to be insensitive to his family. Though to be completely honest, that was the main reason why I left Capcom. ● Ah I understand. When you say you wanted to work with many producers, is that what you were able to do at SNK? Yes, exactly. I was able to do everything I wanted at SNK. In that sense, I was able to work in my ideal environment, even more so than here at Dimps. ● OK, so in your SNK days, you're credited with a lot of games. Which did you specifically spend the most time on? I was the head of development so I was involved with every title. I contributed to the initial concepts for the majority of them, like Fatal Fury, King of Fighters, and Samurai Shodown -- Metal Slug less so. But I was able to manage the development teams the way I wanted. I would discuss a game idea with one of the producers and hand off the development to them while checking in every so often to make sure it was heading in the direction I envisioned. 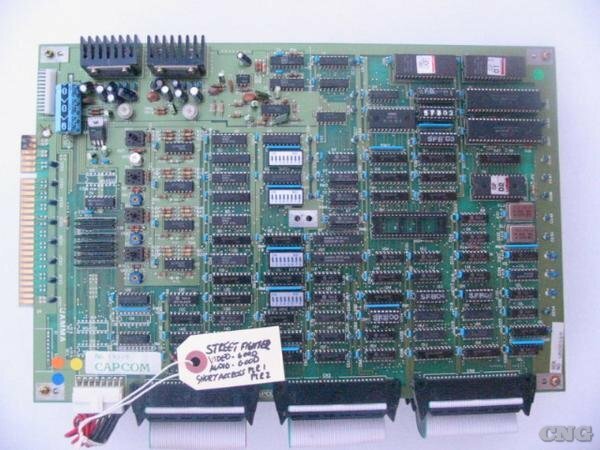 The first major project I was involved in was actually the Neo-Geo hardware. Until then, and I believe it was the same worldwide as it was in Japan, arcade operators would have to purchase a machine for each game. 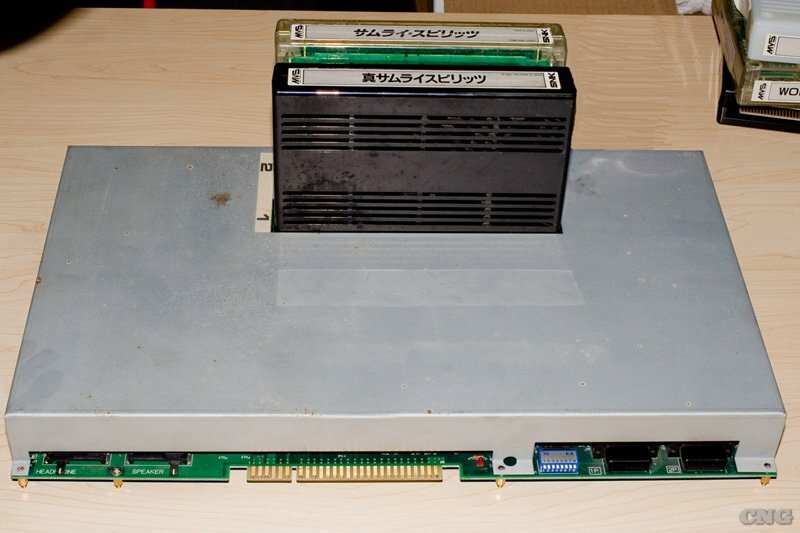 But Neo-Geo systems used ROM cassettes so, like with consoles, operators could purchase the hardware once and switch cheap ROM cassettes to run different games. I'm the one who proposed this idea at SNK, as well as the idea for the home console version. The main reason I thought it was a good idea is it was very difficult to sell new arcade games in China, Central America, and South America because of piracy. By creating a hardware system with cheap software, we were able to sell a lot of games even in pirate-heavy markets, and I think that was one of the main factors that led to SNK's success. 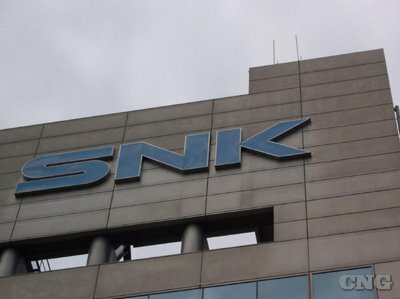 ● During your time at SNK, how much time did you spend on the business side and how much time was spent on the creative side? I spent about 80% of my time working on the creative side. I was the executive managing director of the creative department, so most of my time was spent there, but I was also on the board of directors so I was involved with the business side as well. the interchangeable arcade software, or "Multi-Video System," was his idea. ● OK, so when you came up with a game idea there, how much would you flesh it out before handing it over to the team? In that sense, the ideas were rather vague. I didn't give specific ideas for the plot or scenario, but I gave ideas for characters and the general storyline -- basically setting the game's mood -- and I would specify general mechanics. I left the rest up to the teams, and I'd check in at various stages to make sure things weren't deviating from the initial idea. ● Which game at SNK are you most proud of? Hmm... I hope this doesn't get misinterpreted. I still consider myself an active game designer, even though my title is president of Dimps. But I've never made a game that I want to play myself, because I think I have a different kind of outlook. I try to look at society from a wider, more objective view to figure out what might be popular in the market, rather than deciding based on my own preferences. I've always made decisions based on what I think will be popular amongst the mass market...so it's very complicated. I think it's the difference between art and design. ● OK I'll phrase it a little differently: which game at SNK did you personally spend the most time working on? [Laughs] I probably spent the most time on the Fatal Fury series. King of Fighters already had characters from other games, so I was able to apply those to a party game. But I think the game I put the most effort into was Fatal Fury -- especially because that was the first game I made after leaving Capcom. Actually, there's a bit of a story there. 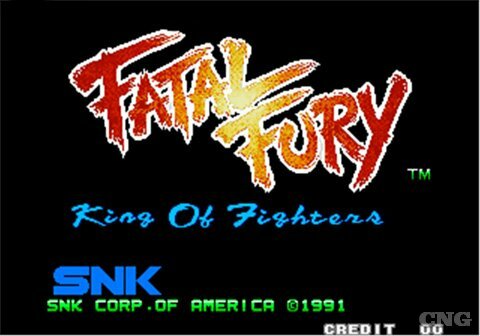 Because we released Fatal Fury after Street Fighter II, the public criticized SNK for copying Capcom without knowing that I was the one making Fatal Fury and that we started development before Street Fighter II was released. So I felt a certain objection to that criticism. Now people know, but back then SNK and Capcom didn't get along. There was a big rivalry, especially on the business side. some of the same people who made Street Fighter were behind it..
● Was it uncomfortable being in the middle of that? On the development side, we all get along -- even now at Dimps there are people who moved with me from Capcom to SNK. So the companies didn't get along, but the developers remained friends and would go out for dinner and such. The rivalry was at the top, but the teams saw each other more as friendly competition. ● Can you remember pulling any pranks on each other? [Laughs] There were things like that, but we included them in the games -- we didn't do anything in-person. They were things that only Capcom's team would pick up on, or inside jokes that only the SNK team would notice. Of course, the public wouldn't be able to pick up on most of them, but we put them in as inside jokes. ● Do you remember any examples? Hmm... They were minute details, so I can't recall anything specific, but I know that things like that were going on at the time. 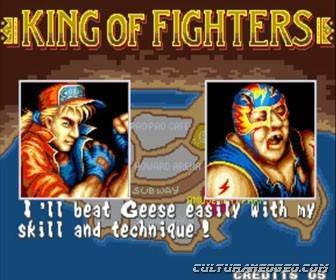 For example, SNK made a character as homage to a Street Fighter character. ● Dan? [Edit: I mixed up SNK and Capcom in Nishiyama's answer above -- my reply here should read "Ryo" from Art of Fighting instead. [Laughs] Yeah. There are a bunch of stories like that. ● Was it strange for you to eventually see the Capcom vs. SNK crossover games? Actually, I initiated that. Mr. Okamoto, who I mentioned earlier was the head of Development Team 3, was running Capcom's development at the time. And SNK was struggling financially -- we had built large facilities and were manufacturing original hardware. So I tried to come up with a project that utilized both companies' assets and was a win-win situation. fallen on hard times with trouble at his company Game Republic. ● Since you mentioned Okamoto... are you aware of what he's said about you in the press in the past? I've heard that he's mentioned me, but I don't know the specifics. ● Well... In one interview on 1UP, actually, he said you were attracted to men. Yeah, I know. It's weird. He was joking, but some websites reported on it as a fact. [Laughs] Me? No, no -- I'm straight. He likes to joke around. It's usually hard to tell if he's telling the truth or lying. That's who he is. ● Ah, right. OK well to get back on track -- why did you decide to leave SNK to form what was to become Dimps? Well, SNK started to lose direction. The company had exploded to the point where there were over 600 people just in development. They made some wrong business decisions and were about to be bought out by Universal Entertainment Corporation, a Japanese slot machine company. As the head of development, I had to take responsibility for the situation and leave. So I submitted a letter of resignation, but when I resigned, I didn't have any plans for what to do next. I just felt I had to leave. In Dimps' earliest days, Nishiyama had a desk in a corner of the office, and little else in place. ● So, then you created Sokiac? I didn't have specific plans right away. After I left, various individuals who I will leave anonymous approached me and offered positions at companies in Tokyo. But at the same time, the core SNK development team members also left, assuming I had plans. SNK's headquarters was in Osaka so if I was to take a position in Tokyo, they would all have to move to join me. So by creating a company in Osaka, I didn't have to worry about moving my team and their families. Then a handful of individuals supported me: Former president of Sammy and current chairman of Sega Sammy Mr. Satomi, former head of Bandai and current chairman of Bandai Namco Games Mr. Sugiura, former SCE president Mr. Kutaragi, and CSK founder Mr. Okawa. We all met in Tokyo and they told me that if I were to make a company, they would help. At the time, we were all competitors. There was talk of Sega and Bandai merging, but that plan fell through, and Sega and Sony were both console manufacturers at the time -- Sega with the Dreamcast and Sony with PlayStation. So they were all competitors but they came together for the industry and to support software development. ● From the outside, that seems pretty unusual. How much does that structure affect your day-to-day work? Our company name, Dimps, is short for "Digital Multi-Platforms." In other words, we don't limit ourselves -- we want to provide our services to a variety of genres and platforms. That's our company's mission, and that's one of the reasons why we changed the name from Sokiac to Dimps. Just because Sony releases a new console doesn't necessarily mean that we'll make software for that system. And the same goes for Microsoft, Nintendo, or any other platform. So although we started with a lot of support from different companies, none of them told me that I had to make games for a specific system -- only to make good games that would support the industry as a whole. In that sense, it's a very noble gesture by all parties involved. 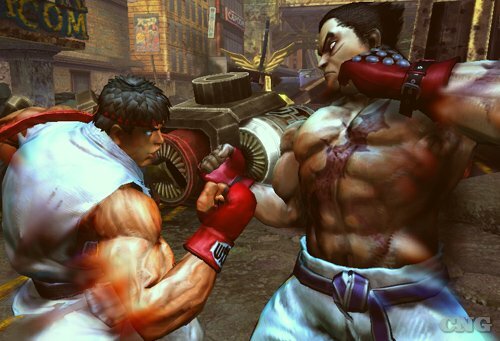 ● In recent years, Dimps has been known for its work on Street Fighter IV. I was looking through some old notes the other day, and I saw an interview on 1UP with Yoshinori Ono from Capcom where he said you were one of the main reasons that game got off the ground. How did that come about? Keiji Inafune worked under me when I was at Capcom, and in the old days after Street Fighter III didn't do so well and the fighting game market shrunk, Capcom decided to leave the genre behind. But later he took over the company's development and proposed Street Fighter IV, and I don't think Capcom had people available to form an in-house team to develop it, so Mr. Inafune proposed that they should have Dimps make it, and Capcom approached us with the proposal. ● I think a lot of people are confused about that game, and whether they should think of it as more of a Capcom title or a Dimps title, and as far as I can tell the answer is split down the middle. What's your take there? Many of our key staff members at Dimps are former Capcom developers, myself included. So we make games for various platforms and work with a variety of companies, but we're most familiar with Capcom's culture. And Capcom has extremely strict quality control. Mr. Tsukamoto, our director who worked on this title, lost about 10 kilograms during its development, and he's not a particularly big man to begin with -- maybe 60kg or so. 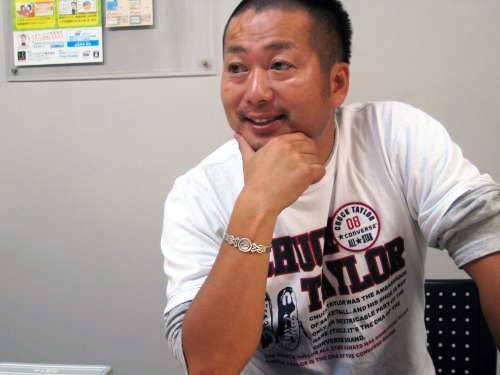 Mr. Ono and our development team clashed a lot and it was a very stressful title, especially for Mr. Tsukamoto. But Capcom was the client so he had to try to satisfy them as best he could while trying to motivate Dimps' development team. As a development studio, we're dependent on three things: The budget, delivery date, and timing. We need to receive a budget and a delivery date from the client and if the timing doesn't fit with the schedule of our other titles, we won't have the manpower to take on the project. So those three things have to come together and Mr. Tsukamoto had a difficult time trying to coordinate that. However, we were able to improve our quality control by utilizing a new project management system called Scrum while working on Street Fighter IV. We actually gave a seminar at [Japan developer conference] CEDEC this year regarding our experience using Scrum to manage game production. I believe that Capcom's strict quality control pushed us to utilize a more efficient project management system. In 2000, Dimps rounded up its staff members to pose for this photo. 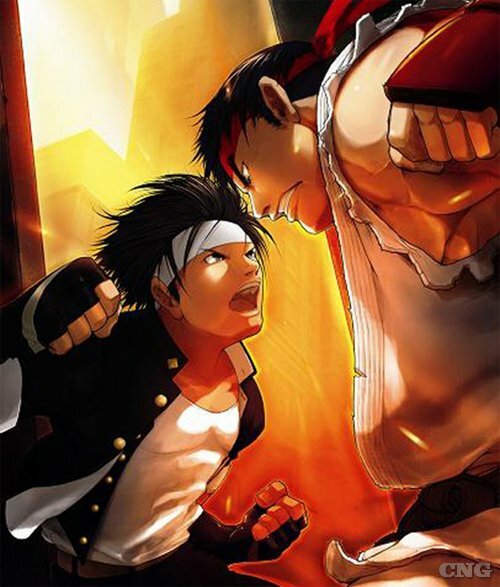 ● So the fact that your company was working on Street Fighter IV -- did it feel like you were coming full circle in your career, back to where you started? Yeah, especially since Capcom had left the fighting game genre. 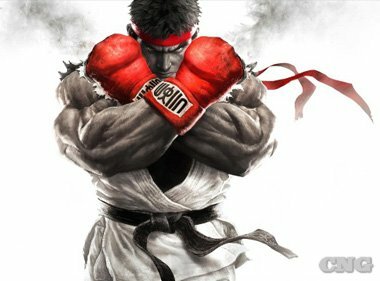 When they approached us to create SF4 for release on the day of the 20th anniversary of the original Street Fighter, it felt almost like destiny to me. ● Did you put any personal Easter eggs in the game because of that? No. I left the game's development solely up to the team. I don't get involved in development at Dimps like I did at previous companies. There may be rare instances where I'll say something, but for the most part I don't give input on development these days. crossover, mixing characters from Nishiyama's past with those of his former competitor. ● Looking back over your career, is there something that you're most proud of? I'm turning 55 this year, and when I look back on the 30 years I've been working in this industry, I'm proud that I've survived. I've seen the industry change from the arcade days to consumer games and now to social and browser games. It keeps changing. And the fact that I've been able to adapt to the changes means I'm a survivor. It's like Darwin's Theory of Evolution -- only those who adapt best to their environment can survive. This is one reason why I don't talk to the media, actually. I'm a great admirer of Soichiro Honda, the founder of Honda Motors, who said, "The product doesn't lie." Working in this industry, it's tempting to show off and talk on a grand scale. But development is background work; we work behind the scenes. So I want people to judge the product, and I accept both praise and criticism for it. It's my policy that I let the products speak for themselves while I remain in the background. That's why I've avoided the media. But the fact that I've been able to survive in this difficult industry amongst many people who have come and gone -- that's something that I'm very proud of. ● Since you've gone so long without talking to the press, why did you decide to come out of hiding now? You mentioned Dimps' 12th anniversary before -- is that related? I still don't feel the need to come forward into the spotlight, but the reason I agreed to this interview was because, first, the Japanese media had given up contacting me since I hadn't spoken to anybody in years, and second, because Dimps needs to change. Dimps is a development studio that takes on projects from clients, but we want to start creating our own intellectual property. We come from working at publishers, so our background is in creating our own IP, and I feel that it's time that we need to create our own social and browser IPs. In order to do that, I felt it was time for me to come forward and announce that to the public. un sistema online muy adictivo que tuvo muy buena crítica..
● Is your goal to make these specifically for phones and browsers, or are you thinking about consoles, downloadable services, etc.? Well, console development costs have exploded -- in Japan, it costs over a billion yen to make a console game. And for a studio of our size to create a new IP, there's too much risk to create something of that scale. So we're going to start with things that have more manageable budgets, like social and browser games. I believe that's more realistic. We're looking at smart phone games first, and if they succeed, we'll release them on other platforms. I'm sure the market for smart phones is growing in the United States as well, but in Japan and the rest of Asia it's growing at a very rapid pace. It's hard to explain, but we're currently working on a social media application that has game-like qualities. It's more like a communication tool. There's a company in Japan that has been very successful and has expanded the market here, and I think this market is going to continue to expand in Japan and other countries in Asia, like China, Indonesia, and Vietnam. ● And you're not talking about the specifics of this product yet, right? No, we're currently moving in that direction. We need to be careful in our announcement because we are currently working as a development studio that receives projects from publishers. From a publisher's point of view, we're a very convenient work-for-hire company. But as soon as we announce that we're creating original IP, we become their competitor. So we need to approach it carefully and be sensitive to the politics involved. That's why we've waited until now to announce it. ● OK let's finish with a broad question: Where do you see Dimps in 5 to 10 years? Hmm, I get asked this question a lot. We all make predictions about the future and try to foresee what will happen, but the reality is we're rarely right. I mentioned this earlier but I think the key is to be adaptable to the changes in our environment. Our industry is going to continue to see many changes, both technological and culturally. But Dimps will survive by staying alert to these changes and adapting quickly. We don't want to merely survive, but also be a source of change through the new IPs we create.